During the past decade, we’ve seen a hard push toward more subject-specific magnet high schools, tech schools, and other choice programs that better prepare students for the career choices they’re making at increasingly younger ages. Many high schools now require community service hours to graduate. Many others have full-time employees tasked with finding internship programs for students among community businesses. The generations-old experience of going to college to decide what to do in life — and switching majors once or twice along the way — is fast becoming an endangered practice. In Forsyth County, Georgia, officials with the Alliance Academy for Innovation have taken all of this a step further. They have blended career and academics together to create a school with eight distinct career pathways and the courses, opportunities, and unique twists to classrooms to support them. 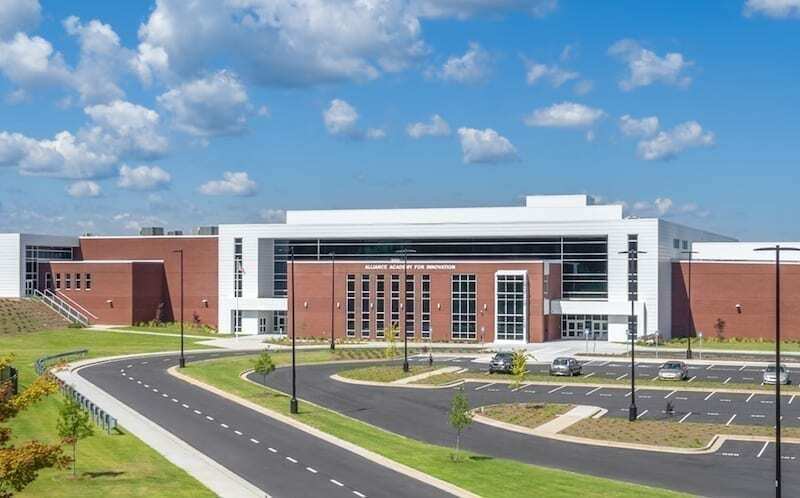 After five years of linking academics, a thriving business community, and career tracks along with the normal requirements of a high school, Alliance Academy for Innovation opened as Forsyth County’s seventh high school on August 2. Photo Series: The Alliance Academy jumps far beyond texts and rote learning, incorporating into classrooms some of the business and training settings that students will utilize in their careers — such as robotics, flight simulators, and mock courtrooms. Alliance Academy for Innovation opened with 510 students, selected from the county’s other six high schools. Freshmen and sophomores make up this year’s first class, but when they graduate, the school will be running a full four-year program for up to 1,200 students. A lottery is planned for the 2019-2020 academic year due to the anticipated demand. Long expects the waiting list to grow, and keep growing, owing this expansion to the focus of the academy. It’s easy to see. Were the eight career pathways a streaming series, they could write their own episodes of “I Dream of STEM,” while also including a couple of non-STEM fields. Included are Cybersecurity, Criminal Justice, Aviation & Flight Operations, Healthcare & First Responders, Energy Systems, Graphic Design, Mechatronics, and Hospitality & Tourism. The fun begins with some of the classrooms. They’re more than classrooms. The Aviation & Flight Operations pathway includes both desktop and actual flight simulators; students will be able to graduate high school with their general aviation pilot’s license. The Mechatronics program, which embodies robotics in a county that has won national First Robotics League titles, has machinery and equipment on par with the best technical colleges. Lanier Technical College will be helping with instruction. For first responders, why not learn from the back of a real ambulance? It’s in a classroom. The Criminal Justice students can brush up on their prosecutorial, defense, and judge and jury skills in a mock courtroom, right on campus. Photo Series: It took five years of discussions, planning and construction to build The Alliance Academy, one of the most innovative high schools in the United States. Now, students will innovate and grow into their careers daily, bolstered by facilities and faculty developed specifically for the eight featured career tracks. The application of core subjects – math, English, science, social studies, and computer science, across a student’s career pathway, is an expansion of the Writing Across the Curriculum concept. It’s taking writing (or solving equations, conducting experiments, or reading) about the student’s interests, and applying it directly to work with the student in the other courses. That way, when they enter their careers, they’ll already know the math involved and also the type of business communications and reading material required to excel. There are plenty of typical high school activities as well, including extracurricular clubs. However, they’re not random clubs, but focused on career and technical advancement, such as First Robotics or SkillsUSA. What you won’t see are athletic teams. The budgetary focus will be squarely on academics and career prep. Alliance Academy for Innovation started with a conversation five years ago. As educators and administrators began to develop a curriculum, they sought out the Forsyth County Chamber of Commerce, which got to work on the businesses. It wasn’t a hard sell: Forsyth County is already the fastest-growing county in Georgia, a tech and manufacturing mecca, the proud supporters of national robotics and automotive engine team champions, and a county that graduates a stunning 98 percent of its high school students on time (the national average is 84 percent, according to the National Center for Education Statistics, while Georgia’s average is 79 percent statewide). Furthermore, the county school system works with 100 local businesses, some as large as Siemens and Automation Direct, to provide internships for students. Those internships are getting upgraded at Alliance Academy for Innovation. As juniors and seniors, students can participate in Work Based Learning – a very focused type of internship – or Honors Mentorship. While technically voluntary in the district, these programs figure to be heavily populated by students due to the direct career implications of them. Furthermore, students can take college courses for credit at Lanier Technical College, the University of North Georgia, and Georgia Tech. There is also a Junior Achievement Discovery Center, which opened August 23. It serves six school districts but is housed in Forsyth County. It features JA BizTown and JA Finance Park, where 6th and 7th graders will combine immersive simulations where students explore industries and careers, with foundational knowledge for financial well-being. Alliance Academy for Innovation also ties into programs like National Manufacturing Day, which takes place on the first Friday of October. Forsyth County buses up to 150 students from its seven high schools to four companies for these field trips to explore manufacturing as a career. “If a student started participating in this day as a sophomore, then by the time he or she is a senior, there will be up to a dozen of our companies visited,” Long said. In a county that is trying to keep its highly skilled workforce employed within its borders while welcoming more and more tech and manufacturing specialists, the notion of indoctrinating students to countywide businesses is sound long-term thinking. Just like the master plan that became Alliance Academy for Innovation.